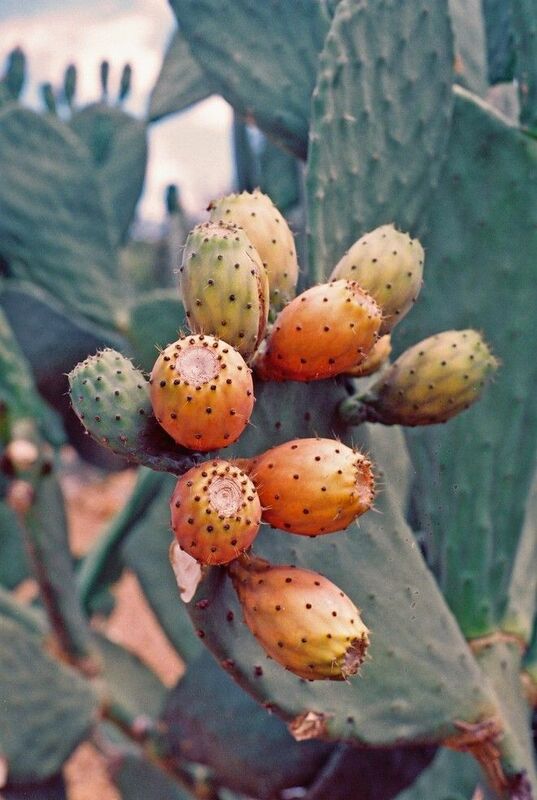 The types of prickly pear that are most common in the Sonoran Desert are the tuberous prickly pear, plains prickly pear, pancake prickly pear, low prickly pear/smooth prickly pear, Englemann�s prickly pear, brown-spinded prickly pear, and the beavertail cactus. To eat a cactus pear, it is important to first remove the spines. If picking your own, be sure to wear thick gloves when removing the glochids. One traditional method for removing them is to roast them off in an open flame, such as a campfire. You can also use something abrasive to brush them off, or just cut them off with a knife. The tungi cactus grows like weeds in the low lying, dry areas of St Helena in districts like Half Tree Hollow and New Ground. Tungi used to be a diet staple but now they fall rotten off the bush as it seems most Saints prefer to buy imported fruit from Cape Town.